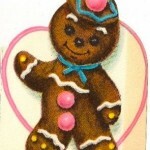 Just because Christmas is over does not mean our LOVE of Gingerbread is over! 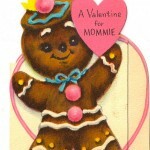 Valentine’s Day is just around the corner and we cannot think of a sweeter way to your “sweetie” just how much you Love you them then by a vintage / retro Valentine greeting card and how about making a Valentine’s Day themed Gingerbead House. 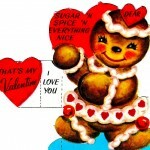 Check back real soon as we will post all kinds of Valentines Gingerbread Houses!! Click on pics to enlarge. 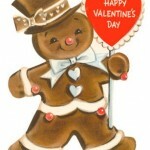 These are also referred to as Anthropomorphic greetings cards.